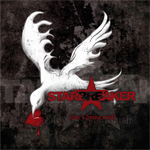 Two simple reasons give me cause to grab the latest Starbreaker work 'Love's Dying Wish,' and they are outstanding vocalist Tony Harnell (ex-TNT) and guitar guru Magnus Karlsson (Allen/Lande and others). Starbreaker's 2005 debut was a nearly perfect work of melodic metal. Now, in their return, expectations are undoubtly high. But be prepared for something akin to their former work, yet quit different as well. 'Love's Dying Wish' has a more contemporary sound offering a more down-tuned and somewhat dark melodic rock style. Still, this album shines with Harnell's brilliant vocals and Karlsson's sterling and accurate fret work. This contemporary feel is immediately apparent at the outset of the album. Though 'End Of Alone' still travels the road of melodic hard rock, 'Evaporate' and 'Love's Dying Wish' bring an obvious modern influence. When Starbreaker does this, they do it very well. This theme continues on other songs including 'Hide,' 'Building A Wall,' and 'Changes Me.' Yet, within all of these songs and the entire album is the prevailing undercurrent of tradional melodic hard rock. This is what makes 'Love's Dying Wish' work so well: it's a fresh approach to a classic sound. Forgetting the modern nuances for a moment, there are, simply, some great songs on this album including the aforementioned 'End Of Alone,' 'Beautiful Disaster,' and 'Live Your life,' where, on both, Karlsson thrills on guitar. While this album may take some fans time to understand and enjoy, I believe with patience and careful listening they will find 'Love's Dying Wish to be a true gem. Recommended! Starbreaker's sophomore release 'Love's Dying Wish' is an unexpected offering. It's more melodic hard rock than metal and a bit more modern in style. Not exactly a curve ball but it is a more than subtle departure from their debut. It's a refreshing and positive approach to a classic sound.